I must apologise for such a big break between posts. One of my dearest family members became very ill and passed away so I have been away several times in the past few months helping out. It has been a very sad time for me but I also very much valued the final time I had with him & the time I have with others in the family. I have an exhibition coming up in December so it is now a matter of working solidly to complete the final couple of designs, get the designs I have completed carved & printed, get the handcolouring completed on those prints ready for framing, get them framed & then organise cards/posters to be commercially printed. Phew!! Not much really!! One of the new designs I have been working on includes Wildflowers from the Blue Mountains, just outside Sydney to the west. It is a beautiful area with mountains, gullies and stunning wildflowers and wildlife. I always loved visiting this area when I lived in Sydney and still do when I can get a chance. 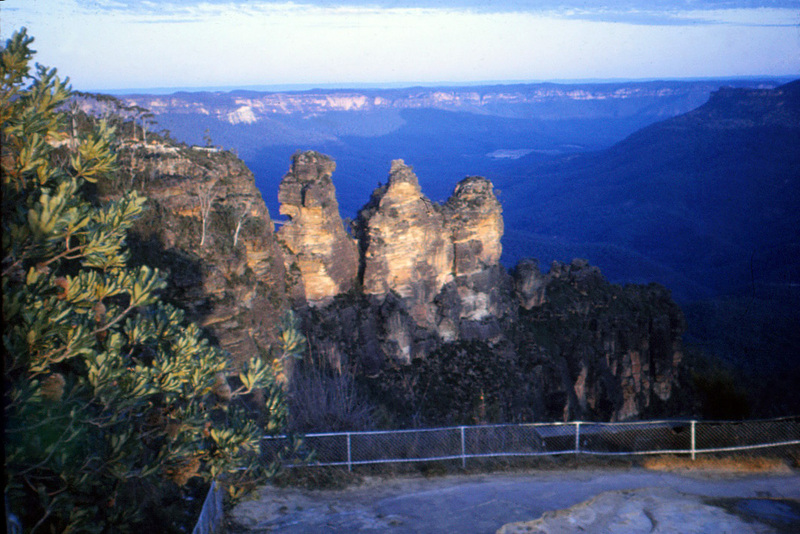 This is an old photo taken by my Godmother probably in the 1960’s or 1970’s of the famous ‘Three Sisters’ at Echo Point, Katoomba in the Blue Mountains. The area was very popular in the early 1900’s and many of the buildings and ‘the style’ of the buildings is from the Art Deco period. This is also one of my favourite periods of Australian art & architecture history so I decided to base this particular design using a familiar design ‘pattern’ of the time. In fact the concept for the development of this design came from an old mirror dating back to this time that had been my mother-in-law’s. I had just been scribbling a few ideas when I thought about this mirror which is in my studio. The silvering on the back needs repairing but I thought it was such a lovely old mirror with scalloped edges that I had put it away in my print studio until I can afford to do it up. From these initial ideas I then research and work through a species list of wildflowers from that area and go through my photo files to find out which species I actually have photos to work from. As I work from my own photos for my designs it is important to me that I then go & find any missing species that I may need photos of to complete the design. I will draw up a basic framework into which I will create the design. This may change & evolve as I work through what species I will use & how I arrange them. For this particular design I decided for the first time to mirror reverse the side panels. It seemed to work much better to do this. 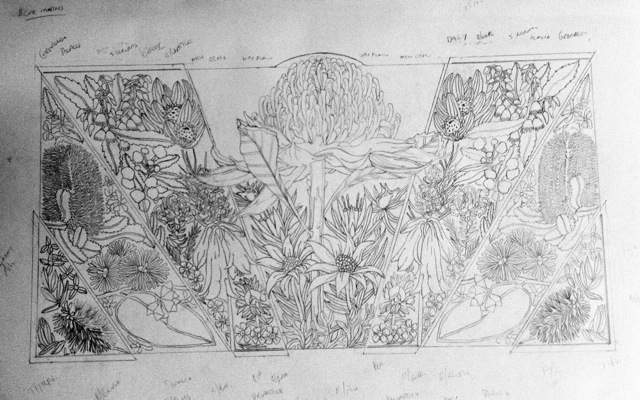 Although I do know that in the carving process small variations will occur as it will be impossible to repeat exactly the design on both side due to the flexibility of the lino & just sheer human fallibility. This is the final result of the designing. As you can see I have made notes about which species I have used within the design. 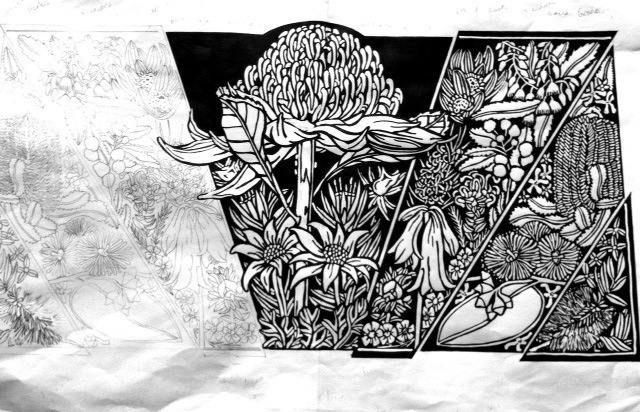 From here I then photocopy the design & ink in the black areas. Until I have a final template to work on. This way I find I make far fewer mistakes in the carving as well as galvinising the design in the process of creating the black & white image I make adjustments as I go. This is the final template. You can see some of the changes I make – this is particuarly evident in the Blue Mountains Gum leaves. I started the carving of this a couple of months ago before I was called away and have spent the last week working on it. These are a series of images of the carving process. Almost done! I should be able to finish this carving tomorrow and then to printing! I can’t wait to see the final design printed and handcoloured. Very good to see your post appear. I’m sorry for your loss, but glad to see you back again. Interesting about your mirror and the inspiration it provided. 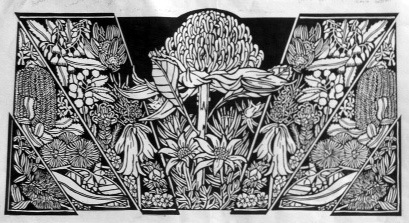 I find the intricately carved lino quite beautiful in itself and look forward to seeing the prints.